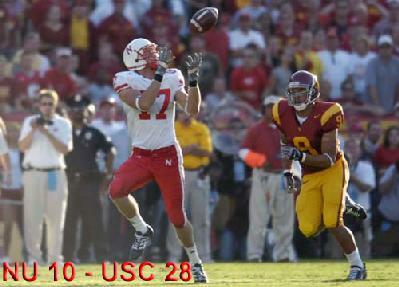 Todd Peterson (17) led the Husker passing attack with 72 yards on 2 receptions. Maurice Purify outjumped Jordan Peterson for a 9-yard touchdown catch with 21 seconds left, stunning a partisan Kyle Field crowd of 83,336. LB Bo Ruud had both a fumble and interception return that led to two Huskers' touchdowns. RB Brandon Jaskson rushed for 182 and 2 touchdowns on 21 carries in a losing effort aginst the Oklahome State Cowboys. Terrence Nunn fumbled a pass reception that would have given the underdog Huskers a first down and essentially secure the win. The Blackshirts Defense held Kansas St. to only 22 total yards rushing. RB Cody Glenn scored 2 touchdowns rushing for 148 yards on 19 carries. The Huskers needed overtime to beat the Kansas Jayhawks 39 to 32. Kenny Wilson (27) rushed for 106 yards and 2 touchdowns in last Saturday's 56 to 0 victory over Troy. (WR)Todd Peterson catches a pass on a fake punt in first-quarter action. The Huskers pounded the Colonels 56-7 this Saturday before a drenched crowd of 84,076 at Memorial Stadium. Nebraska began the 2006 season with a 49-10 dismantling of Louisiana Tech before 85,181 at newly-expanded Memorial Stadium.